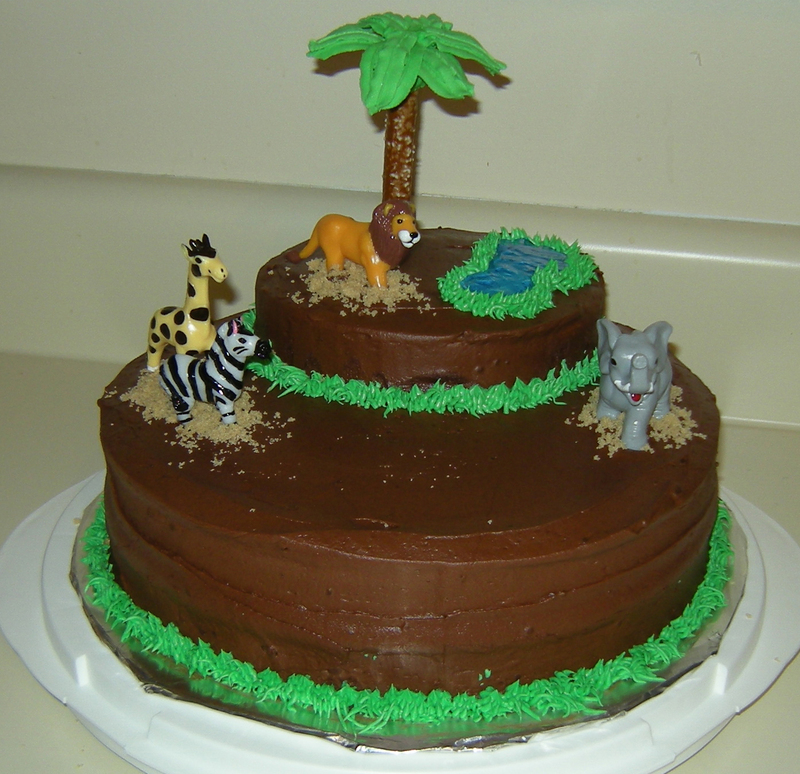 My friend, Tyler, was there for the baby shower when I made the jungle cake. After the shower, she emailed me and asked me if I could make her a cake for an engagement party she was throwing. 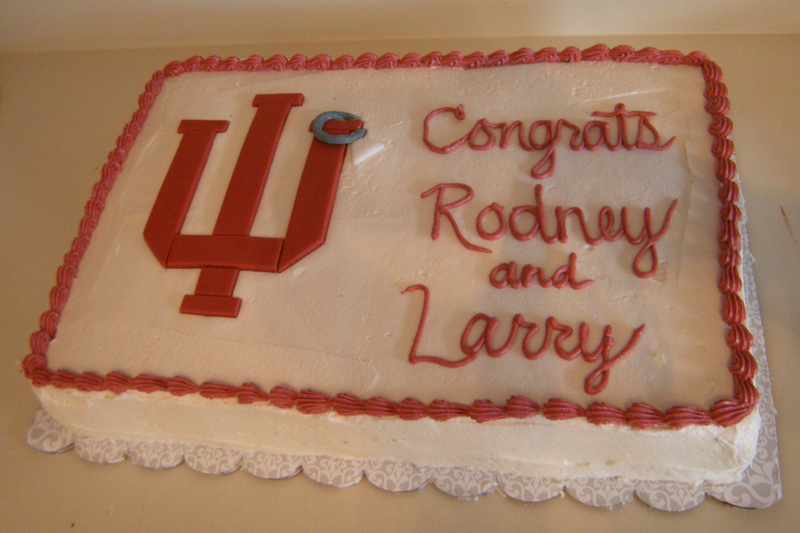 She wanted a sheet cake to feed about 50 people – and for decoration, the Indiana University logo with an engagement ring hanging off of it. I made 4 9×13 cakes – 2 chocolate and 2 yellow. I stacked them and placed them side by side to make a 1/2 sheet cake that was approximately 12×18. I also made a quadruple batch of Wilton’s vanilla buttercream. A quadruple batch! A pound of butter, 4 pounds of sugar…I was stunned by the sheer quantities of butter, sugar, milk, and eggs I stocked up on for this cake! For the logo, I purchased ready made fondant (Wilton) this time. I found it slightly less tasty, but quite a bit easier to work with. I assume because the ready made stuff is exactly the perfect consistency, where as my homemade stuff…isn’t. Anyway, I tinted some of it maroon using Red-Red and Burgundy colors. I rolled it out and used a ruler and a pizza cutter to cut out the pieces for the logo. For the ring, I used gray and white fondant and used cookie cutters to make the shape. I also tried using luster dust for the first time. I mixed some silver dust with lemon extract and painted the gray ring to try to give it a sparkly finish. I wasn’t too impressed with the results. Perhaps I should have used a much lighter gray fondant as the base – or just white. I also used pearl white dust on the “diamond” on the ring. I thought the hardest part of this cake would be the logo. I was wrong. That was the easiest part! I thought sheet cake = easy, right? It’s just a rectangle, no tiers, nothing fancy. Yeah…it was a lot more difficult than I anticipated. I just don’t have the space in my kitchen or the equipment to make a cake of this size efficiently. I was having trouble with the cakes themselves – cooling them, flipping them, etc. Plus I needed space to lay out 4 cakes, plus work space for two huge bowls of icing. It was certainly a challenge, but I am pleased that it came out well! January through March is birthday season in my family! First my birthday in January, then my both of my parents in February, and then my sister’s in March. We had a combined birthday celebration for my parents and since there are two of them, naturally we needed two cakes! My dad loves and always requests spice cake with vanilla buttercream icing, so that was a given. And for my mom I decided to go with chocolate cake with peanut butter filling. My parents are avid bridge players and when I discovered I owned heart, spade, club, and diamond cookie cutters when I was making my Valentine’s Day cupcakes, I knew I had to do something with a bridge theme! I made two 9×13 sheet cakes – one was spice cake and one was chocolate cake (both box mixes). I also made a double (or maybe it was 2 1/2, I can’t remember) batch of Domino vanilla buttercream. And in addition to the peanut butter filling, I also decided to whip up a 1/2 batch of chocolate buttercream. 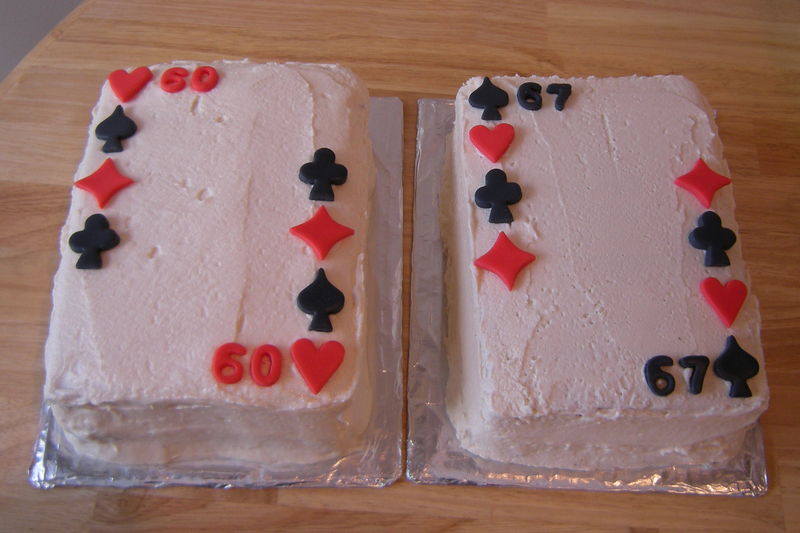 When the cakes were cooled, I cut them each in half and put one half on top of the other and trimmed them into playing-card-shaped rectangles. I filled the spice cake with vanilla frosting and the chocolate cake with the peanut butter and the chocolate. I covered both cakes with the vanilla icing. For the decorations, I used marshmallow fondant again. I made a small batch, split it in half and tinted half of it black and half red. I used my cookie cutters, plus my brand new letter/number fondant cookie cutters to put each of my parents’ new ages on their cake. In my last post, I was saying how I was so pleased to have given the Domino buttercream another chance with such great results. And now, I’m iffy on it again. For the first cake, it was too thick and I was having real trouble spreading it on evenly. So before I started the second cake, I thinned it with some milk. And that helped a lot and it was much easier to frost. But it was too thin – later I noticed the icing was sliding off the cake!! Ugh, I can’t win. 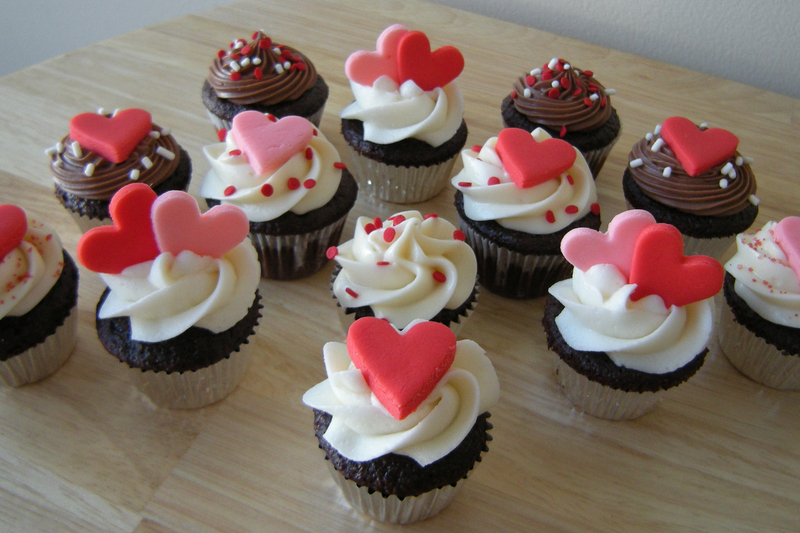 I really need a good all purpose vanilla buttercream recipe that can be piped and spread. So far I have tried only one chocolate cake recipe from scratch and it was kind of “meh” – not too chocolatey. So I Googled and came up with this recipe from Hershey’s. A batch of cake mix always makes far more mini cupcakes than I am expecting, so I ended up quitting after 4 dozen, but I probably could have gotten another dozen out of it. Next, I was going to experiment with homemade marshmallow fondant. I have never eaten, worked with, or made fondant of any variety before and I was definitely excited to try! I found this recipe from Wilton for rolled marshmallow fondant and followed some instructions to make a smaller batch. I found it very easy to make and work with. Once I was done kneading, I divided it into 2 parts and used Wilton’s Red-Red color to tint one part pink and one part red. This is probably the first time I tinted something red and had it actually come out RED! I wrapped each part in plastic wrap and put them in a ziplock bag until the next day. When I was ready to work with the fondant again, I popped it in the microwave for about 7 seconds to soften it up again. 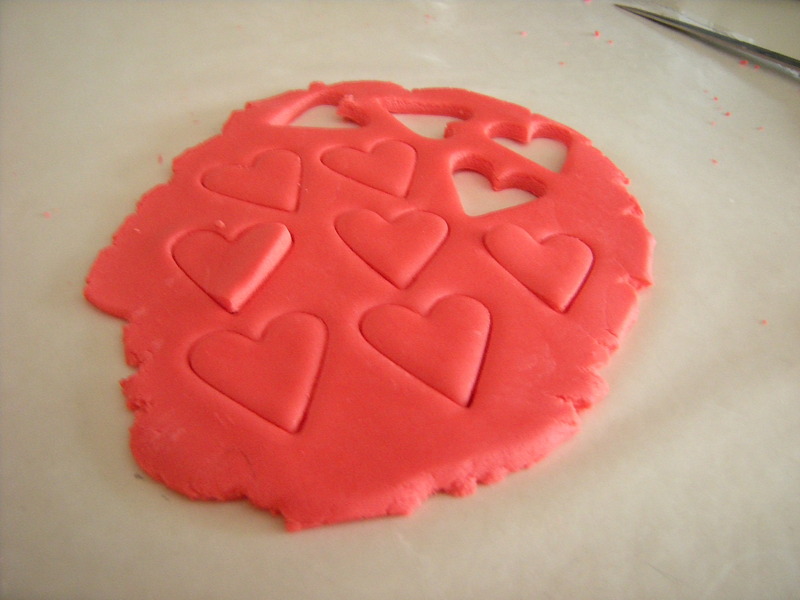 I kneaded it and rolled it out and cut out some hearts with a tiny heart cookie cutter. I kept the little hearts in between 2 sheets of plastic wrap overnight and they hardened a bit, but they weren’t brittle. This morning I made up some vanilla buttercream icing following a basic recipe from Domino (if you buy the 1lb box, the recipe is on the box, but I bought the store-brand 2lb bags, so I had to look up the recipe here). This is the recipe my mom has always used. Last May when I made my first try at piping icing, I made this recipe and it did not hold up to piping and it melted. I blamed the icing, and switched to a shortening/butter recipe after that. But I have since learned that it really wasn’t the icing’s fault afterall – I had added too much milk and made it too thin and that’s why it didn’t hold up! So today, with many more months of experience under my belt, I gave the recipe another go and was able to identify the right piping consistency. And I’m so glad I did, because I think this all-butter recipe has a better taste than when shortening is used. As an experiment, I also made up some of my usual cream cheese icing because I wanted to see how it tasted with chocolate cake. The verdict is not in on that yet. Also, I split the cream cheese icing into two batches and added some cocoa powder to make chocolate cream cheese icing. The combination sounded a little weird, but I wondered how it tasted. My husband thought is was really good, and I have to agree! I will add this to my recipe book. Months ago, some friends and I got together (via email) and started to plan a baby shower for another friend. Right away, I volunteered to make the cake. I was really excited for this and I had about 8,000 ideas! We were doing a jungle theme so I was thinking monkeys, elephants, grass, trees, etc. After changing my mind many times, I finally decided on the design a few days before the event. The cake is Wilton’s golden yellow cake which I have made before and really liked. I made two 10″ rounds and one 6″ round. It is filled with Oreo cream cheese and the icing on top is chocolate buttercream (my mom’s recipe). The green is actually a jar of Betty Crocker icing (eek, I know, but I was already making two kinds of icing, so I thought I’d get the third ready made). And then I used blue gel for the water and light brown sugar for the “sand”. I got the little animals at Michaels – they came in a set. And I made the palm tree out of royal icing and a pretzel rod. This was my first time making and using royal icing (with meringue powder). The palm tree in the picture is actually the second one I made – the first one was sort of messy! 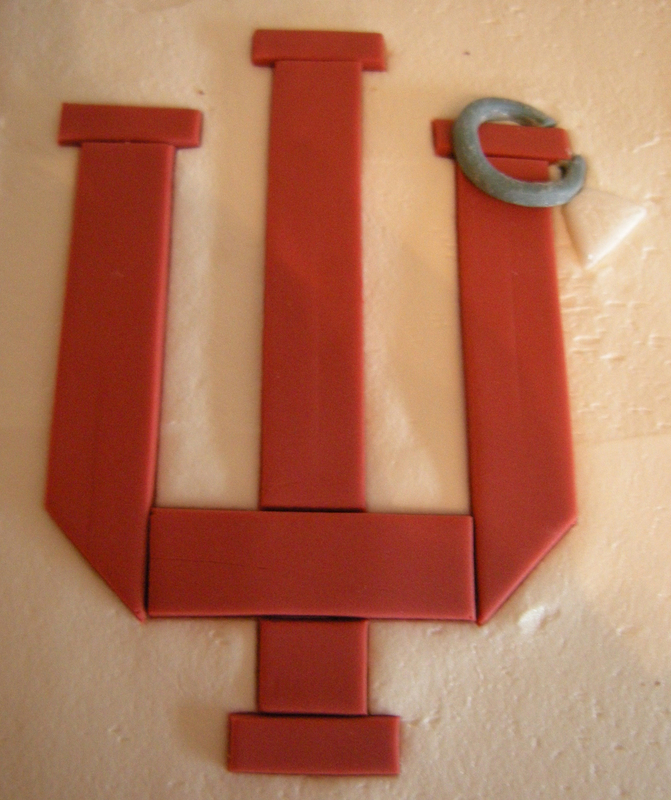 Royal icing needs to dry overnight before being handled – not just 30 minutes – lesson learned! This was also the first time I used the multi-opening tip #233 to make the grass. After my first test, I was thrilled at how it really looks like grass! I am really pleased with how this turned out – it may well be my best effort yet! I definitely worked on it for about 3 days and I am so glad that I could contribute this to the shower. Unfortunately, I was unable to attend the actual shower so I haven’t got the verdict back on the taste yet, but hopefully it went over well!